Romanian Gendarmerie contends that anti-NATO anarchists that came out foundering from the police station have "tormented themselves", bumping against the walls. 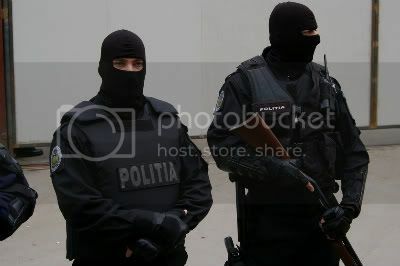 The representatives of the Romanian Gendarmerie have crossed the senseless line when they claimed that the striplings that came out of the police stations with black eyes and with their faces hurt have "tormented themselves". "This is the one that has been the most riotous, this moldavian guy who accuses. There are also other stuff, if i may use a pretentious term, it's called self-tormenting. These guys have started bumping against the walls and screaming "Ouch! He's hitting me." But they weren't hit. We picked the men that were starting to make a scandal from the group and we imobilized them quickly, so that they don't spread and so that the others don't start also. And the other started screaming as if they were hit, to mislead to a hectic state. That's when we started to be ferm and to get those out. ", Marius Militaru said. Of course, there is no proof that sustains the explanations of the Gendarmerie. "Ziua" brings to our attention the fact that all interventions of the gendarms are filmed so that there is no suspicion towards the action methods of the constabulary. About the lack of images, Marius Militaru, the representative of the gendarmerie, claims that "This kind of operations are not filmed". An operation of "this kind" has been though, for example, the one from Sintesti where, some weeks ago, the constabulary has realized some investigations. Then everything was filmed. Also, a very interesting aspect is the fact that although they didn't film the intervention itself, Romanian Gendarmerie was careful enough to startle the industrial hall where the activists were quartered, images of this kind being presented by the majority of the television channels. Images that are focused on the banners and the messages of the activists. Although the officials of the Gendarmerie said that the intervention had nothing to do with the anti-NATO position of the striplings in the industrial hall and that it was a consequence of the aggression against the director and the custodian of the hall. Also, we must precise that the journalists that were present at the place of the intervention could observe some gendarms with video cameras on their shoulders. It's nice to be lied to your face. part of a mass media article. A state that beats up its children has no future.